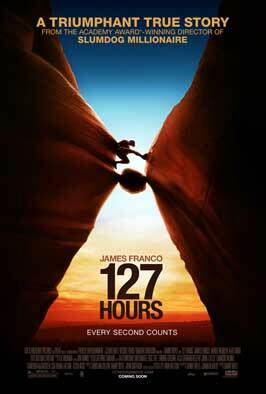 What Would You Do In 127 Hours? Over Thanksgiving break, I went to go see the new movie 127 Hours about the incredible story of Aron Ralston who had his arm trapped under a boulder while canyoneering in Utah. After being alone for 127 hours, he came to the decision to cut off his own arm with a dull pen knife to survive. The film made me think about what would I do in that situation? Could I cut off my own arm? Would I even be canyoneering to begin with? To answer my first question yes I would have James Franco play me in the film version of my life. Wait that wasn’t the first question… but to answer that, it would be no I would not be canyoneering to begin with. I have a fear of heights and I have a fear of climbing alone. To answer the next question I believe I have the will to live to cut off my own arm, but I would definitely have to keep my eyes closed while I did it. Now for the serious question, what would I do in that situation? I would think of my family, my friends, my past, and my future. I hope these things would give me the strength to do what is necessary to stay alive. And in this time of year of finals and holidays I hope you all have the drive and strength to make the rest of this semester a success and won’t ever go canyoneering alone. I’ll be honest–like most students, I spent the majority of my Thanksgiving break dreading the return to classes. But as Sunday night crept ever closer, the only thing keeping me going was my excitement for JMU’s first-ever Cupcake Wars! Around the office and among all my friends, my name has become synonymous with baked goods. To say that I love to bake would be a gross understatement. I live for baking–almost literally, as I teach cake decorating classes at Michael’s. I love experimenting with new recipes and challenging myself to try new techniques, so naturally when I heard UPB was planning this event, I was positively ecstatic. The only thing better than baking is baking is competitive baking. Ever since I happened upon it a few months ago in a fit of summer boredom, I’ve loved watching Cupcake Wars on Food Network. I would give anything to compete on the show (and, believe me…I’ve spent plenty of time scouring Food Network’s website for information on auditioning; alas the option is unavailable.)! For now, though, I’ll settle for judging tonight’s competition. I can’t wait to see what designs you all have in store!